Scappoose firefighters successfully extinguished a nearly two-acre brush fire Sunday, May 6, on Northwest Morgan Road. 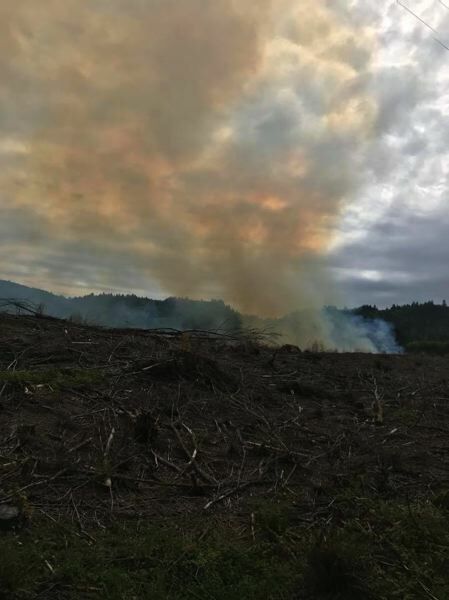 Firefighters with Scappoose Fire District responded to a burn pile that quickly spread to a large blaze around 5:17 p.m. Sunday. According to call information from the fire district, the property owner had logged the site last fall and started a small burn pile while cutting firewood. The burn pile spread into a large fire. In all, 12 crew members responded with two water tenders, a fire engine, a brush truck, and three additional support vehicles. The brush fire was extinguished around 9 p.m. that day. Fire district officials say the property owner did not have a backyard burn permit on file with the Oregon Department of Forestry, or the fire district. "Everyone in our fire district needs to have a burn permit, no matter what they are burning," Cheryl Engstrom, the district's public information officer, noted. The property owner could face fines or violations for starting a fire without a permit. Disciplinary actions, if any, have yet to be determined by ODF and the Scappoose fire chief.